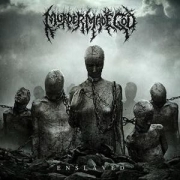 Murder Made God from Greece, formerly known as Human Rejection, is a recent roster addition at Comatose Music. After a busy 2015 writing new material at a fever pitch, they are now ready to uncage their beastly new album ‘Enslaved’. This is the follow up to their highly acclaimed debut album ‘Irreverence’ that was released in mid 2013. ‘Enslaved’ is a technical cyclone of raging brutality with excessive speed and contagious grooves. They are heavily influenced by bands like Decapitated, Origin and Dying Fetus. Murder Made God guitarist Dennis adds, “We are more than happy to announce that we are officially signed to the mighty Comatose Music. We feel proud to be part of such a great roster and have the chance to release our music under this label. ‘Enslaved’ is non-stop brutality and we are excited for everyone to experience this crushing chaos.